Berlin continues supporting the two-state solution for Israel and Palestine despite numerous difficulties related to this option, German Chancellor Angela Merkel said Tuesday. BERLIN (Sputnik) — According to Merkel, it is now especially important to keep the security cooperation between Israel and Palestine, though some Israel's actions are complicating the process of political settlement. "We, President [of Palestine Mahmoud] Abbas and me, agree that we should develop the two-state solution, even if it is difficult and has a lot of complications. Both Israeli and Palestinian peoples have the right to live in peace and safety," Merkel said at a joint press conference with Abbas. Earlier in April, Abbas told Sputnik in an interview that he was always ready to meet Israeli Prime Minister Benjamin Netanyahu in order to engage in serious and meaningful negotiations that would lead to a lasting peace between Israel and Palestine. In late January, then-French Foreign Minister Laurent Fabius outlined plans to arrange an international conference in the coming months to help resume the stalled Israeli-Palestinian talks, stressing that France would be prepared to recognize Palestinian statehood if the talks yielded no results. "We are in contact with France, but of course it should be a wide initiative, in which all the important sides will participate. And we are speaking about it with France and I hope that it will be gradually reached," Merkel said. 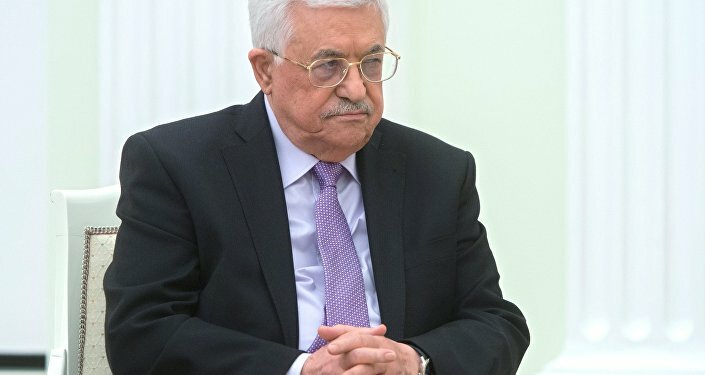 On April 13, leader of the Palestinian Authority Mahmoud Abbas told Sputnik that Palestine highly appreciated the French initiative, which should provide a new mechanism to settle the crisis. Palestinians seek diplomatic recognition of their independent state on the territories of the West Bank, including East Jerusalem, partially occupied by Israel, and the Gaza Strip. Israel has been building settlements on the occupied territories, despite objection from the United Nations. The State of Palestine is recognized by 137 states, including Russia, according to the Permanent Observer Mission of the State of Palestine to the United Nations.